(Nanowerk News) Scientists from the University of Basel in Switzerland have demonstrated for the first time how electrons are transported from a superconductor through a quantum dot into a metal with normal conductivity. 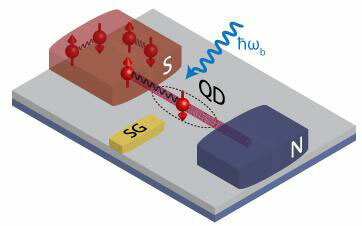 This transport process through a quantum dot had already been calculated theoretically in the nineties, but scientists at the University of Basel have now succeeded in proving the theory with measurements. They report on their findings in the scientific journal Physical Review Letters ("Resonant and Inelastic Andreev Tunneling Observed on a Carbon Nanotube Quantum Dot"). In the past, however, scientists have repeatedly observed that a current nonetheless runs between the superconductor and the metal - in other words, electron transport does occur through the quantum dot. "Our results contribute to a better understanding of the transport properties of superconducting electronic nanostructures, which are of great interest for quantum technology applications", says Dr. Andreas Baumgartner.